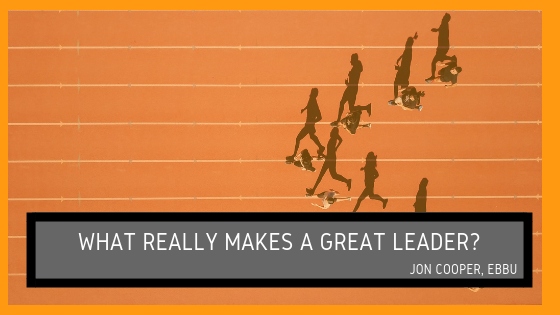 Jon Cooper, ebbu, Asks: What Really Makes A Great Leader? Leaders are not born. They are crafted, molded and developed into those roles. It can be difficult to pick a leader from out of a crowd, but what isn’t difficult is knowing some important qualities that all leaders possess. All leaders clearly possess personality traits that separate them from the competition and make them a cut above the rest. So, what really makes a great leader? All leaders always possess some form of integrity. They will never sugarcoat anything, call it how it is and will be unapologetically candid about it. Whether it is giving credit for accomplishments, personally acknowledging when mistakes are made or when something needs to be prioritized, leaders remain cognizant of the fact that the right thing must be done at all times. Leaders are passionate at their craft, and that is why they are leaders. Having enthusiasm for business is something that cannot be faked, and more importantly, it is contagious. Once employees and subordinates were to witness a leader being enthusiastic, that kind of attitude is sure to have a domino effect and reflect off of the rest of the staff. This personality trait also allows them to identify problems before they have a chance to exacerbate. Leaders, as their title implies, are hard workers. They work relentlessly to make sure that goals are achieved and objectives are met. Failure is bound to happen, but leaders accept that and work hard to make sure there is little failure and mistakes possible. Whether it is trial by error, or taking huge risks, the work ethic of a true leader is something that cannot be replicated. Leaders are also competent decision-makers and can make choices under pressure. This is an admirable trait for leaders to have, because with these decisions come the blame that goes along with it if something were to go wrong. Indecisive bosses are not effective, because too much effort going into making a decision can have a negative ripple effect. Arguably the greatest trait a leader can have is to create future leaders. They lead by example, their employees see that example, and they are developed into leaders themselves. Empowerment is indeed vital for all leaders. by Paul H. Grau, Jr.